It’s been a rainy, cold winter this year. We decided, after being gone a year from home, to stay home after our Alaska/Canada trip. Boy, did we pick the wrong year to do that!!! Like most of the PNW, it has been wet, wet, wet and the rain hasn’t stopped yet here in April. We did take a few jaunts to the beach over the winter. My son, David, moved to Brookings, Oregon so we visited with him and his gal, Brook a few times. It is so good to have him back in his home state and close to me. We are about 3 hours away from him now. After several phone calls to his mom who lives there and then to their manager, we received those details and made our decision. We are going to be camp hosts for the summer! We are excited about this new adventure to a place where we have never been. Telegraph Cove RV Park and Marina on the Johnstone Strait. Duties aren’t much at all and we will have time to explore the island. We will register walk-ins in the evening and check the bathrooms and report to the manager if anything needs done and he will take care of everything. More to come as we don’t start until July. My daughter, Lesa, has loaned me her Canon EOs 50D camera, so I hope to have some awesome photo’s to share. A friend has said she has been there and it is an awesome part of this big world. Life is good. When God puts something in front of you, grab on with both hands! This entry was posted in 2017, Canada, Oregon Coast, Workcamping and tagged adventure, Canon, RV, Telegraph Cove. We were planning how we would get to Bullhead City, AZ from Reno, NV. 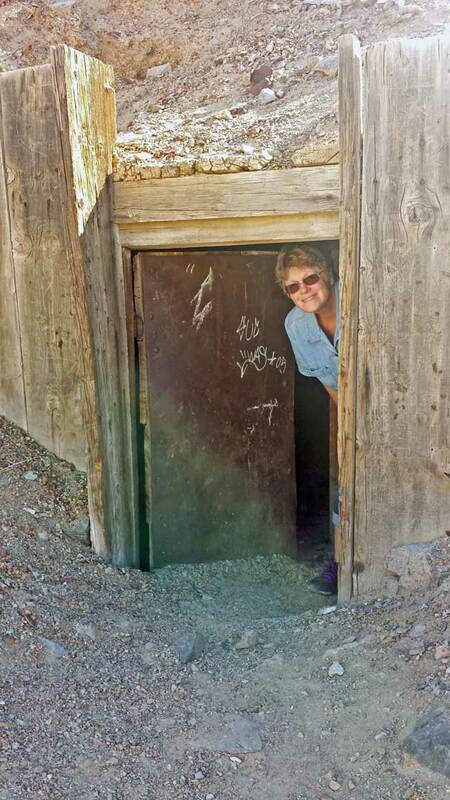 We had two choices – go through Vegas or go down 395. No contest. 395 is one of our favorite roads to travel. 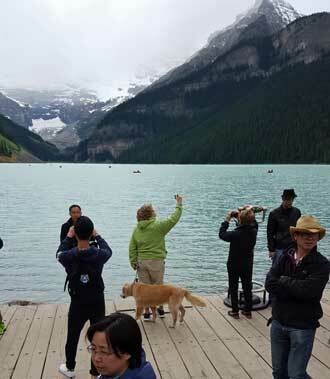 The scenery, lakes, and mountains win out over big cities. 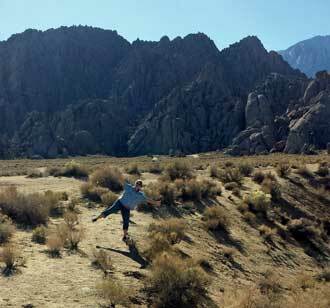 We decided to go to Lone Pine and boondock in the Alabama Hills, which is BLM land. One can stay there for 14 days and get to pick the spot where you want to park. We chose to stay just off Movie Road. Lone Pine Peak is the big mountain in the photo of the Sierras. Mt Whitney is off to the right with the pointed mountain. Our days, as you can see, were full of clear, blue skies and in the 60’s. It did get cool in the evenings and early mornings. Morgan and Annie loved being outside and free. We stayed 5 days in excellent weather. The wind did start-up our last evening. Some at 40 mph that rocked the trailer pretty good. 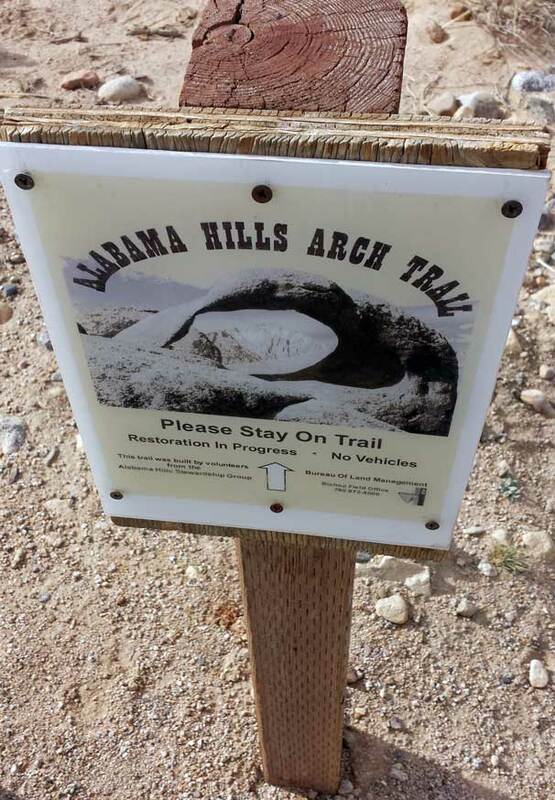 We hiked around the trail to the arches. The China Naval Basin was near by and so we got to hear jet noise. Greatest sound. The views here are incredible. We drove up the Whitney Portal Road to where the trailhead for Mt. Whitney begins. The trail is 11 miles up to the top of the mountain. The increase in elevation is like 6000 feet. It was quite chilly up there at 8000 feet. 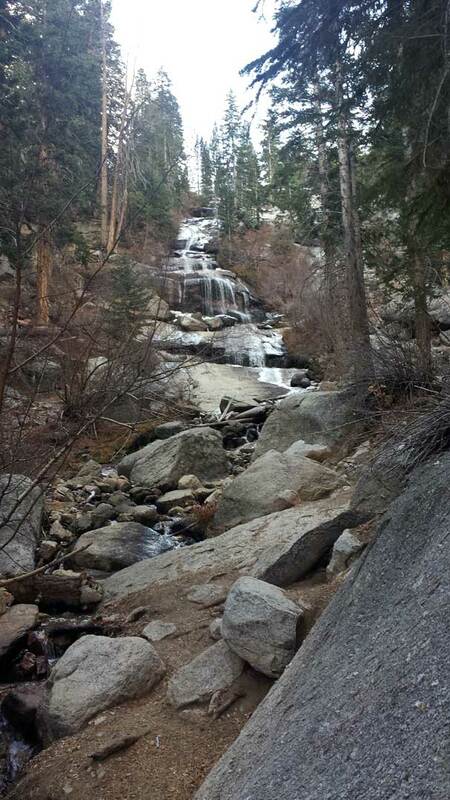 Waterfall coming off the mountain. Morgan on the bridge crossing the creek. The next day, Dale took off early to hike up the trail. I sat in 60 degree weather at the trailer watching a storm come through the mountain. Dale did say it snowed on him. He kept to his 8 mile hike but would like to come back and do the whole trail. 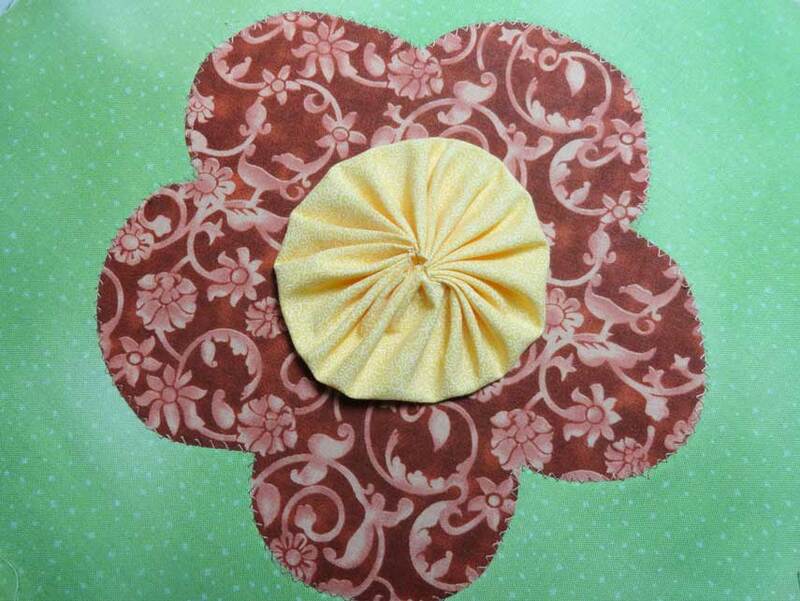 I took the day to sew and enjoy the suns warmth. 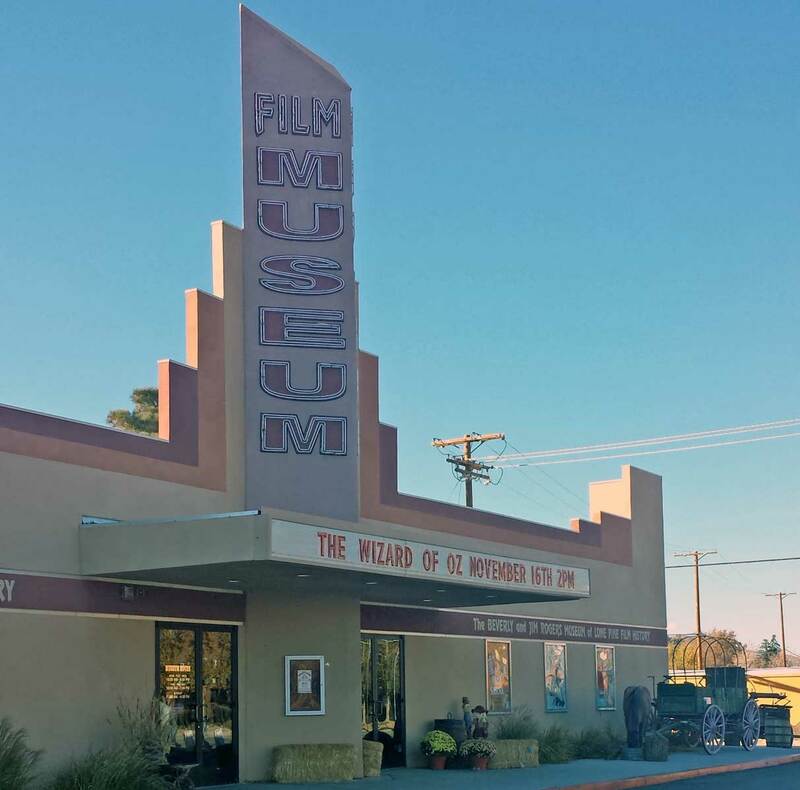 We took in the Lone Pine Film History Museum while here. 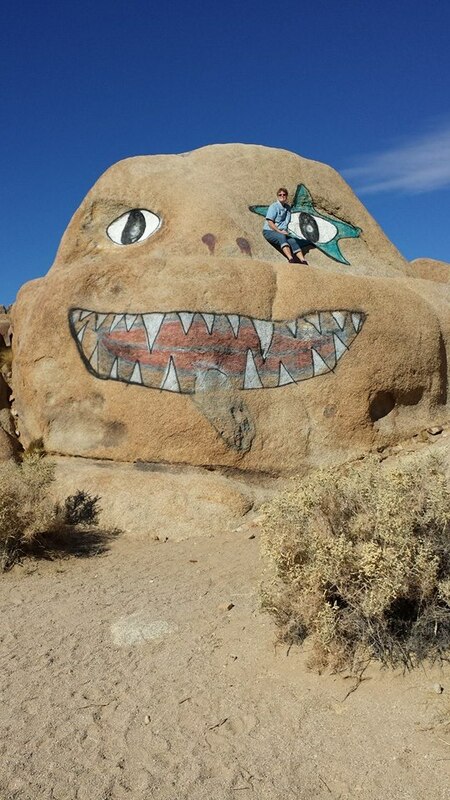 The theme of the museum comes about because of all the “B” westerns that have been filmed in the Alabama Hills. We were quite pleased at the content of the museum. Wasn’t cheesy at all. 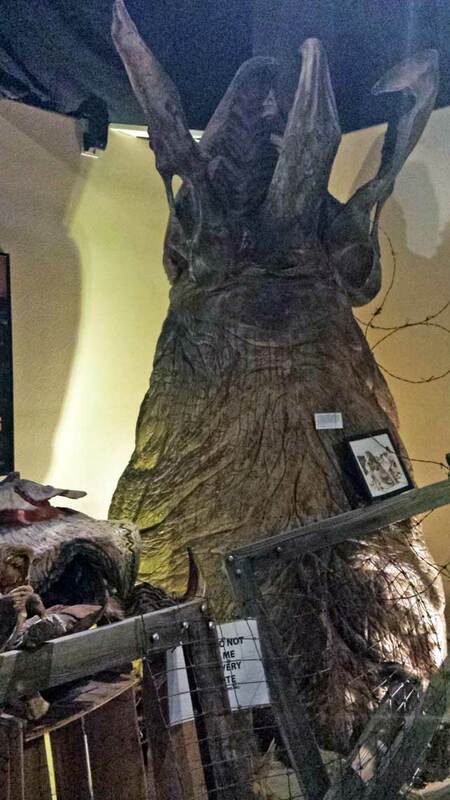 The museum had a display for the movie “Tremors.” I had a good laugh remembering when I first saw this movie with Kevin Bacon. We bought a movie when we were finished walking through all the displays. “Seven Men From Now” with Randolph Scott. It was fun seeing where we were camped on film. 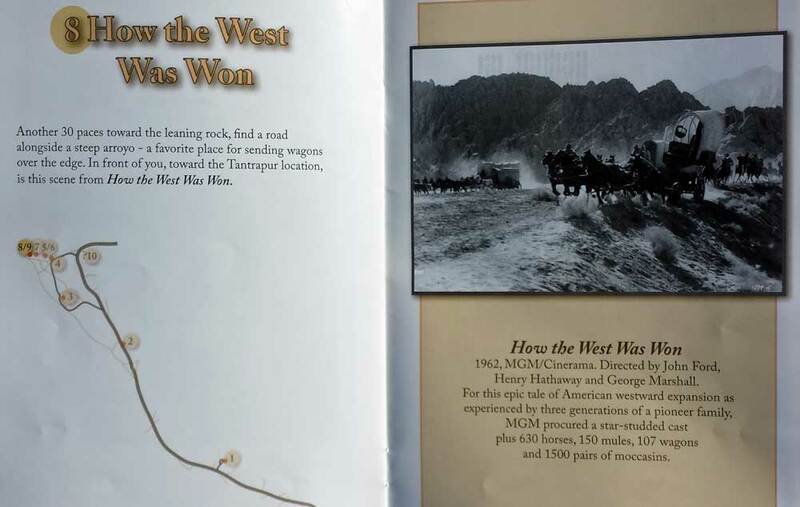 The museum also sold a book with maps to the sites from the old movies. So we trekked off in the hills to find each and every place where the chosen films were made. The grave site in “Rawhide.” Filmed in 1939. There are way too many movies made here to list. Roy Rogers started is film life here. Get a list here. Some of “Iron Man” was filmed here and had the suit Robert Downey, Jr. wore in the first scene. A great place to visit. After having lunch at the Lone Pine Cafe and Bakery (great, great food) we decided to do some Geocaching. I think we found 5 or 6 caches in the hills. 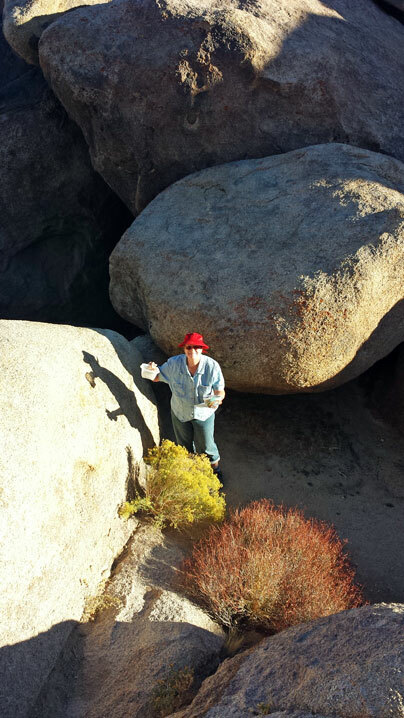 It was fun to find them but also do some rock climbing and see other parts of the hills. An old mine. Saw several of these in the hills. Morgan and Dale had a good time too. 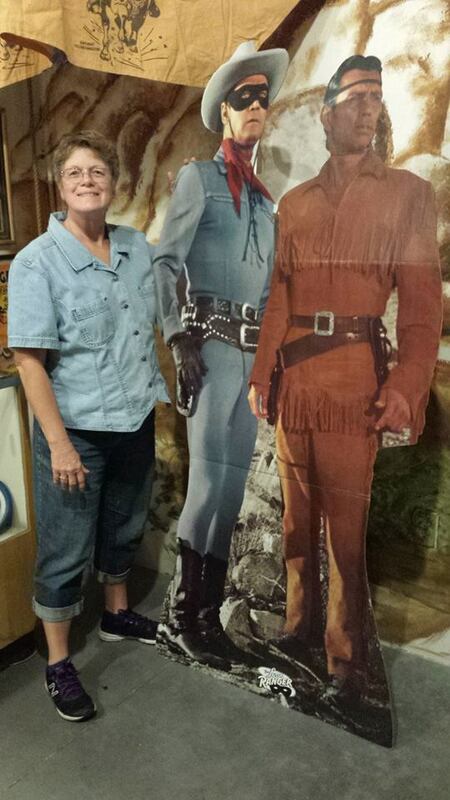 The museum has a “Western Film Festival” during Columbus Day weekend in October. I think we will plan to attend on our way south next year. As always, our stay here was another adventure that made us happy and content. This RV life – is good! 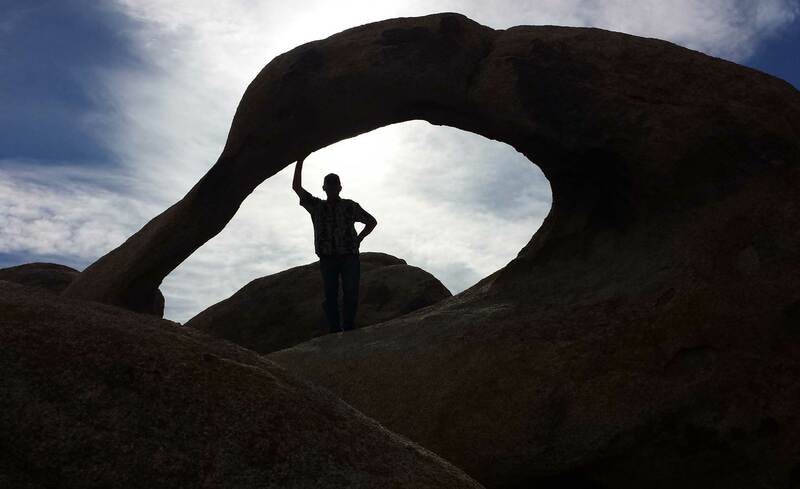 This entry was posted in 2014, Boondocking, California, GeoCaching and tagged Alabama Hills, Lone Pine, movies, Rocks. 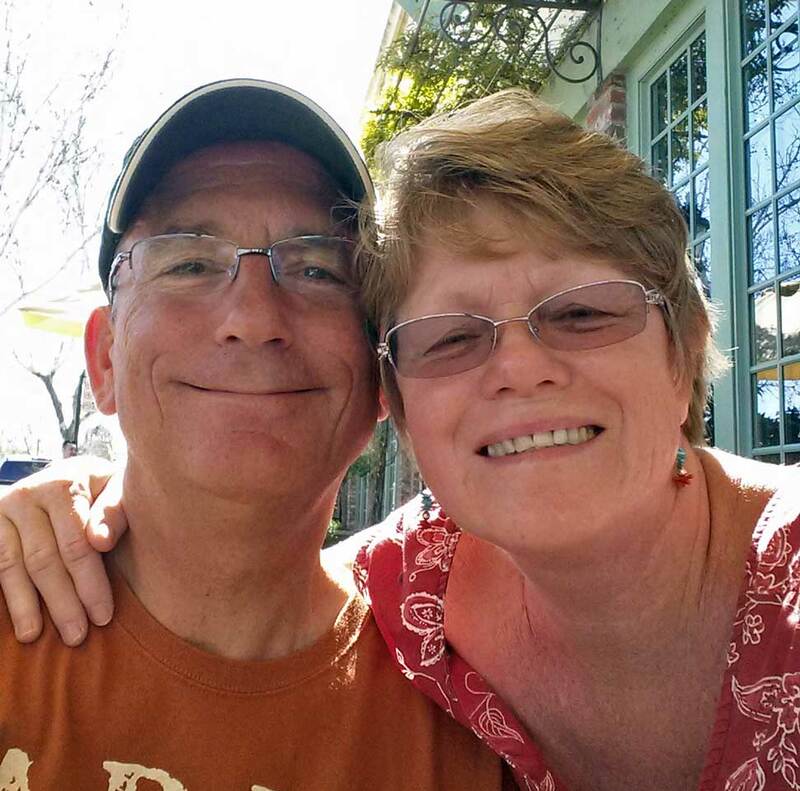 While in Lodi visiting Dale’s mom, we celebrated our 14th anniversary. Well, we tried to celebrate. Each place we picked for a nice dinner was closed on Monday, March 17th. So dinner was out was OUT. We thought maybe a movie and lunch but then many errands got in the way for last minute details to be taken care of before we left on Tuesday. So, we decided to celebrate at our favorite eatery when we get home. 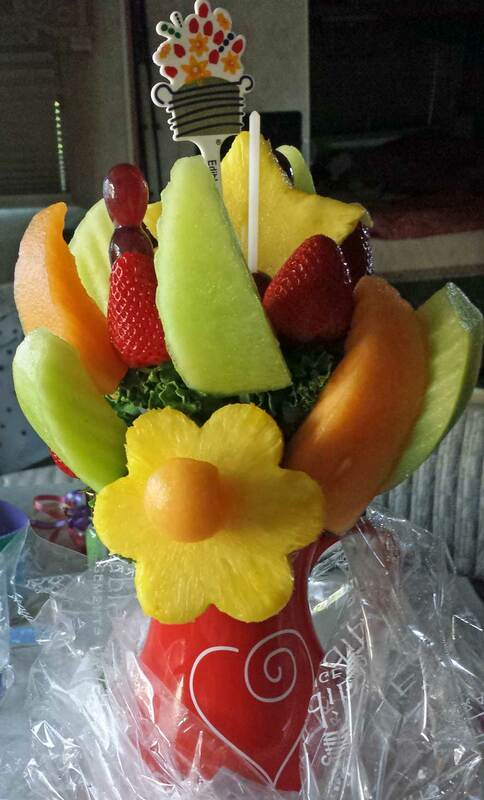 This is what my sweetheart got me. The day before we went to lunch at our favorite place in Lodi, The Dancing Fox. So we could call this an early celebration! It’s been a good 14 years! Sure, ups and downs, but on a whole a very good life. Thank the Lord for all our blessings and our love. This entry was posted in 2014, California. 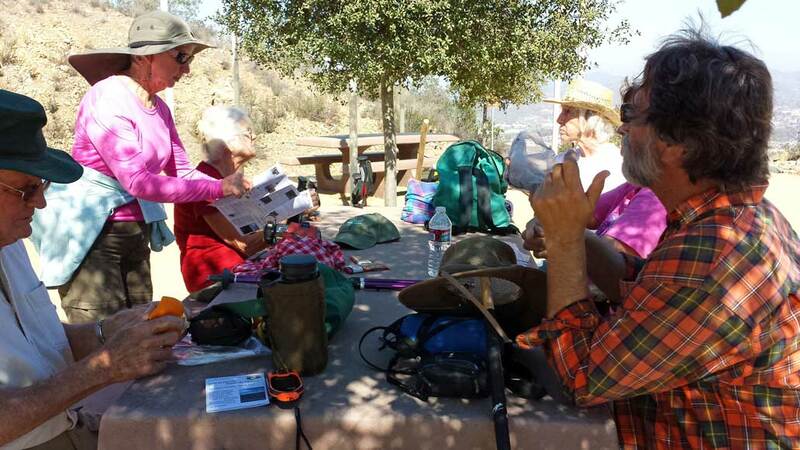 Jojoba Hills Resort SKP park has a hiking group. 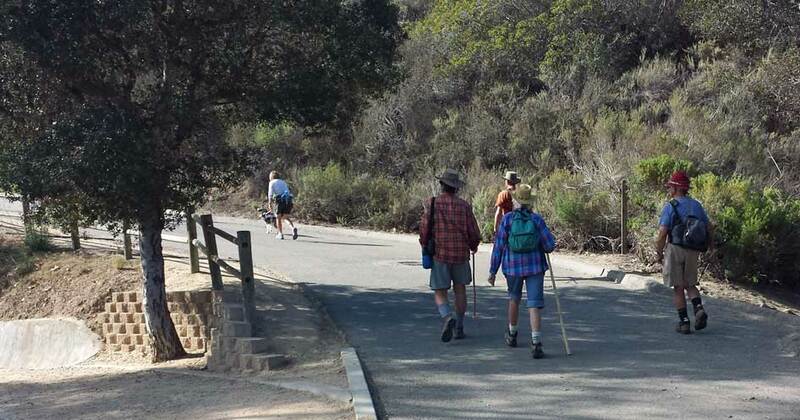 They meet every Tuesday and may plan an extra hike on the weekends. Some of these members hike every day as their morning exercise. Dale joined the group for two hikes and I did one. Little did I know that we were climbing 1000 feet to the top of a mountain! We drove to San Marcos, home of Cal State of California. 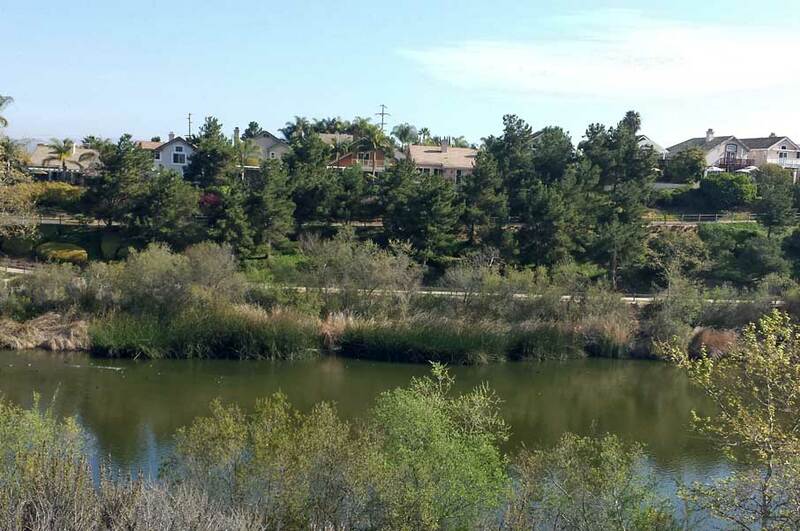 They have a beautiful park system with many walking/running trails. One such trail goes around a lake. We drove this leg in Miss Scarlet with Rick and Grant riding along. We drove south about 30 miles from San Diego to this town. We had to park at the “trailhead” to make it a good 5 mile hike. Others went to the parking lot at an easier beginning to the trail where we walked a quarter mile to! Going was ok but the 1/4 mile walk after the hike was UGH! I was able to meet the ladies (and guys) in the group and we would all spread out and chat along the way. 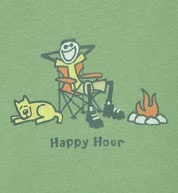 When RVers and Full Timers get together there is a lot to talk about. Then we hit a flat stretch that was also shaded. The sun was hot and I was able to get a good tan. Along the trail others of the group would wave to us across the canyon. So we waved back and just followed. We came to a fork in the trail and turned left to follow them. When we arrived at the rest stop not far off the freeway we knew we made the wrong turn. Come to find out this group lost the first group too and we should have turned right at the fork to go to the top of the mountain. So we took advantage of the facilities at the rest stop and ate our snacks and got water. We all decided we did not want to go back and find the trail to the top of the mountain and were finished for the day. 3 miles was good and we had 3 miles to go to get down. Here’s a view of San Marcos. As you can see there is a “marine layer just hovering above the mountains. I was told by 81 year old Billy that California does not have smog. They have a marine layer. This actually was a marine layer but he can’t fool me! 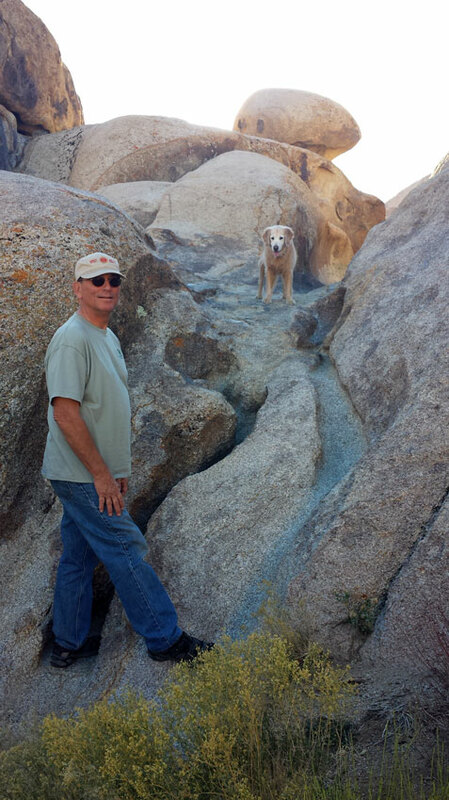 Yes, Billy is 81 and he can out hike all of us. There was also a man hiking who had a 3-way bypass and he went to the top. Of course, my Dale went to the top. He was waiting with the others at the fork in the trail when we came back. It was a good day. We all stopped at Nessy’s, a long time hamburger joint in Temecula that is just a trailer like building and eating outside. It was full and the line backed up. The hamburger was good (we shared) and had a drink and fries. Them some of the group went off to Rite Aid for ice cream. Our car didn’t want ice cream so we went back to the park. Once there, the tradition is to go right to the hot tub. So we did and enjoy more chatting with the folks. We will miss them. 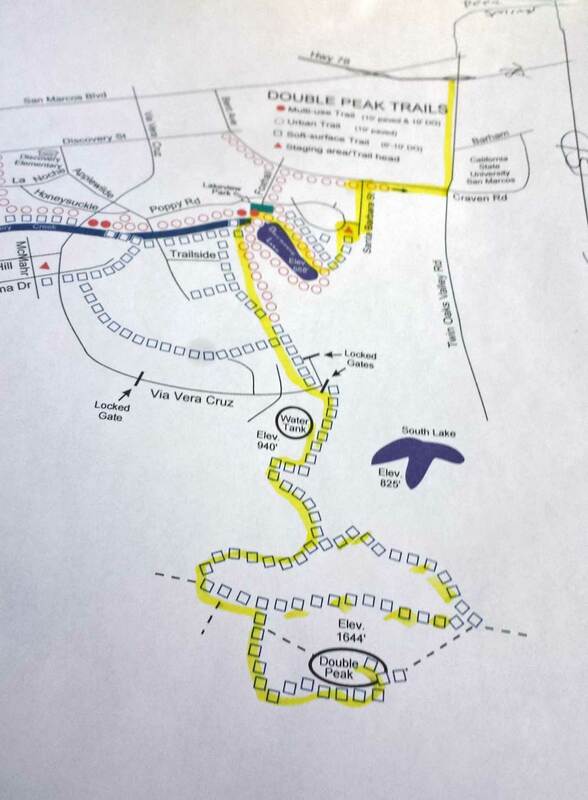 This entry was posted in 2013, California, Escapees and tagged Double Peak trail hike, san marcos. 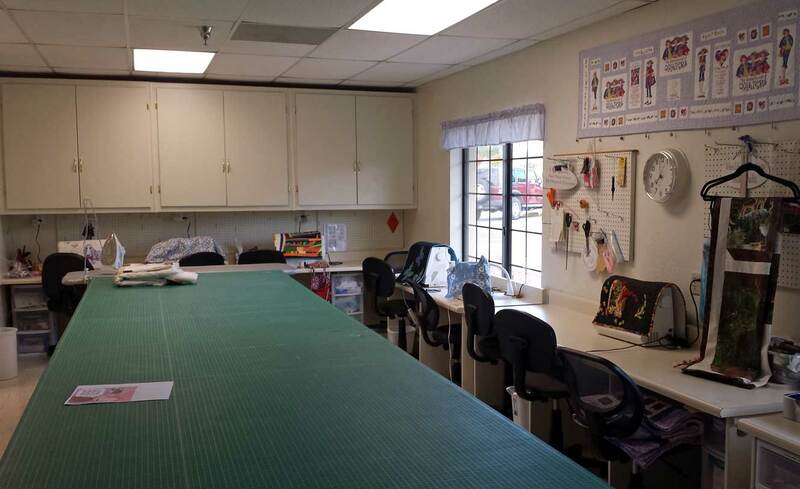 Here at Jojoba Hills the one exciting thing for sewers is the sewing/quilt room. When we knew we were coming here my first thought was “the long arm quilter!” So I bought material in Yucca Valley to make a quilt for our bed in the trailer. The material was 108″ wide, so no seams. And I could get it quilted for a lot less than a regular quilt store. And the tools they have for anyone to use! This room is a gold mine. Just a sample! 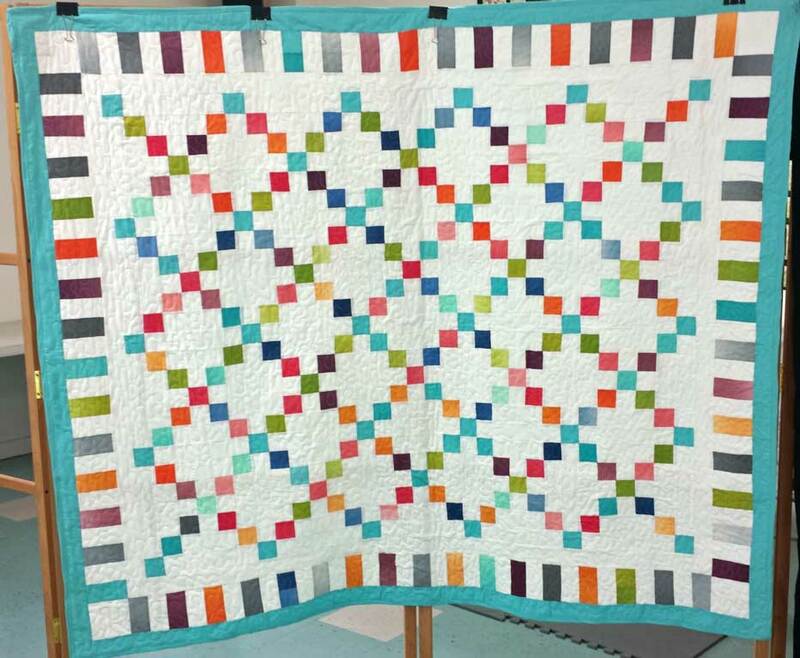 We were hooked up with Yvonne who said she would quilt my quilt. So Dale and I laid it out and cut it on this cutting board above. 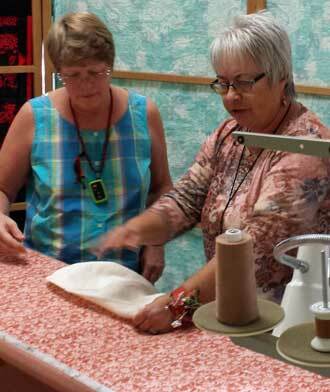 We then layered the quilt – top, batting, bottom and Yvonne and I went to the long arm and pinned it on. We couldn’t proceed because a meeting was taking place in the friendship hall. So we all went to lunch. 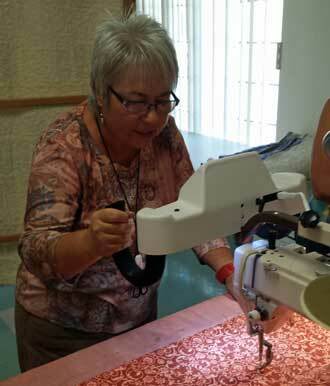 Dale and I came back a couple of hours later and Yvonne almost had the quilt quilted. It is beautiful and adds so much color to our bedroom. 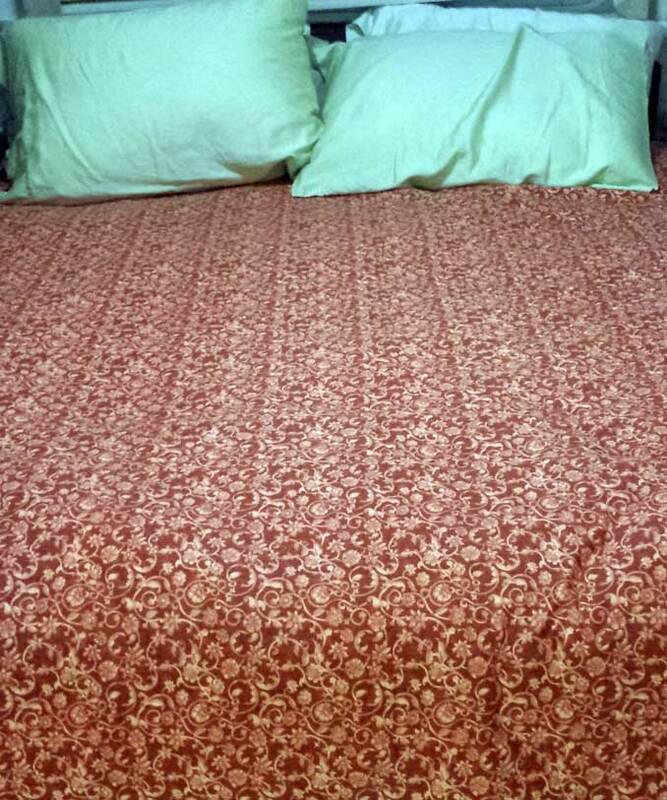 Yes, I know…pillow shams are next! 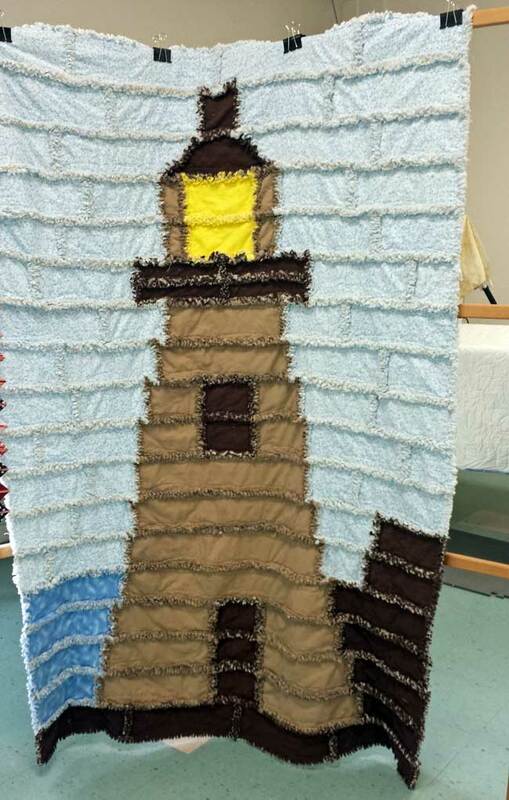 Here is some of the quilts that come out of that quilting room. 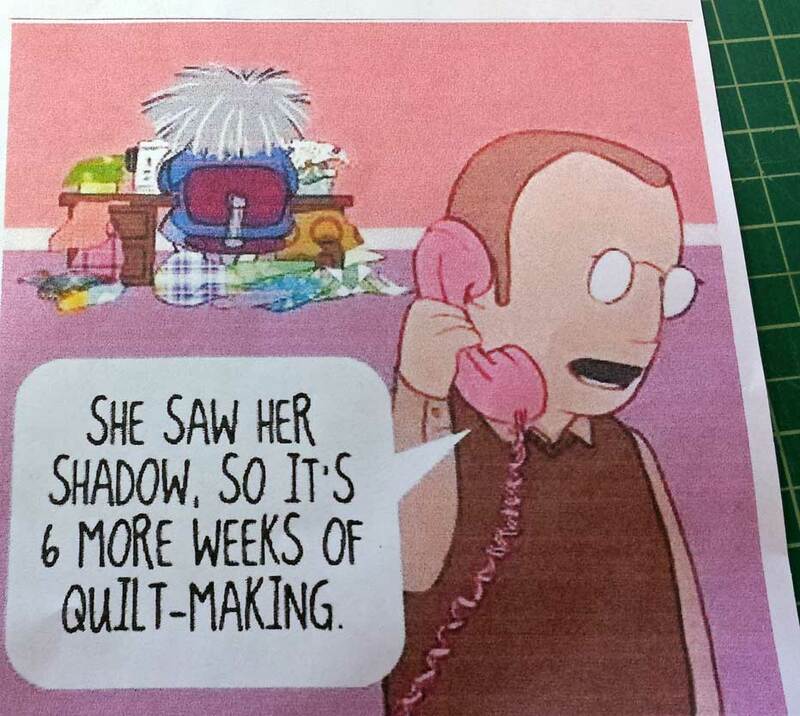 Like many things in our life that we like to do, this quilting can become obsessive!! 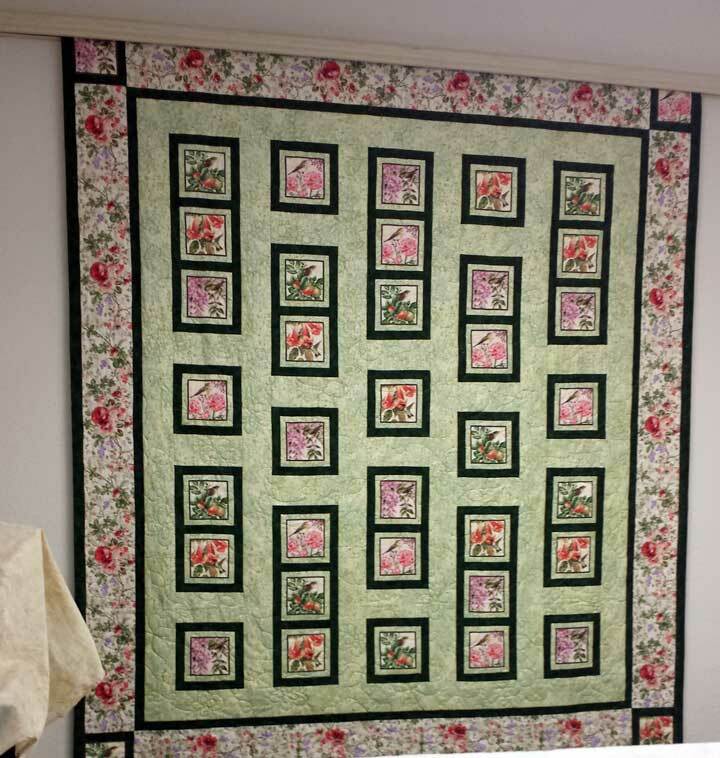 This entry was posted in 2013, California and tagged Jojoba Hills, long-arm, quilting. 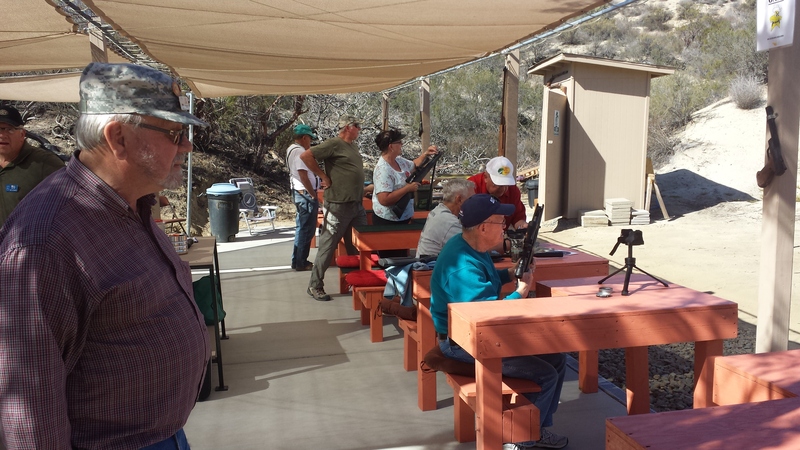 Had to take in Bingo once while here at Jojoba Hills. 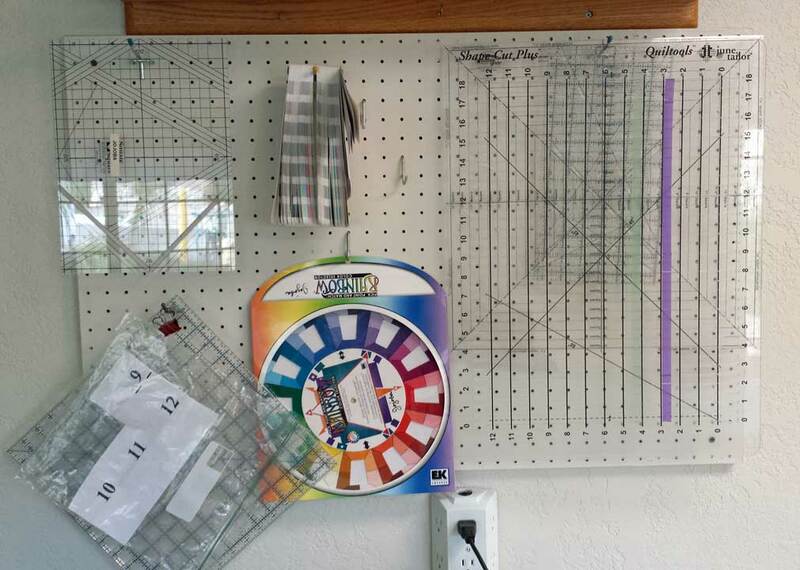 They use paper cards with daubers. Our daubers were back at the ranch so they let us borrow some. The folks at home would be glad to know we didn’t win! 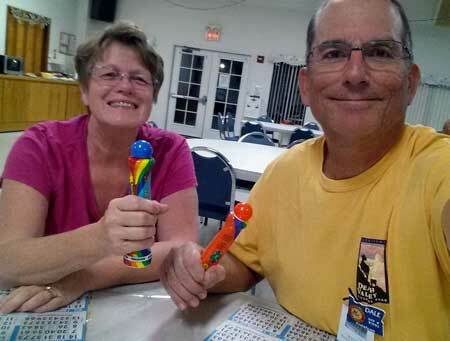 (because we win a lot when we go to Bingo at home!) It was a fun group and a good evening with new friends. I won’t bore you with the mundane things like laundry at 8:30 a.m. or breakfast at 10:30 when laundry was done. 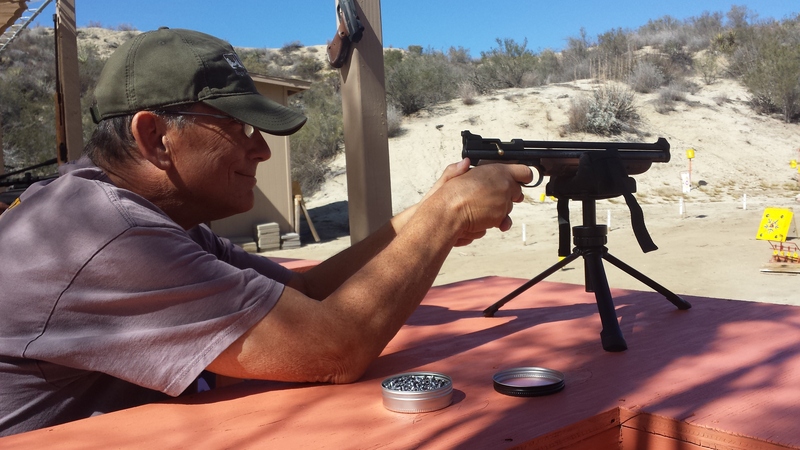 I will tell you about going to the Air Gun Range and shooting a pellet rifle. This place was so cool and put together by the fellows and gals from funds they collected. Dale lines up a shot! 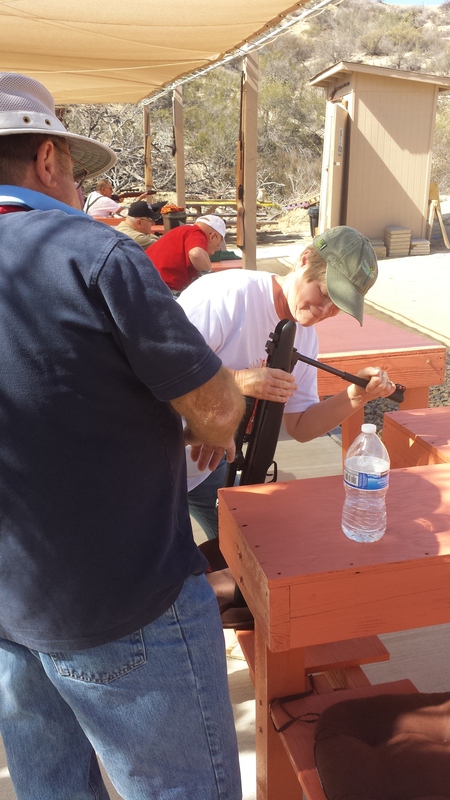 Cocking these rifles and adding the ammo would get us killed if the Indians were attacking! The next part of the day I decided to hit the exercise room and work off some calories. Paperwhite Kindle. A nice relaxing day. I then came home and gave Dale a haircut and worked on a square for the Patchwork Posse challenge. My first applique and it was fun. And somewhere in there I worked in dinner. That was my day! One of the best! Tomorrow will be a good hike with the hiking group! Life is good as the sun shines brightly. God gives us everything we need to function in this life – in His word. 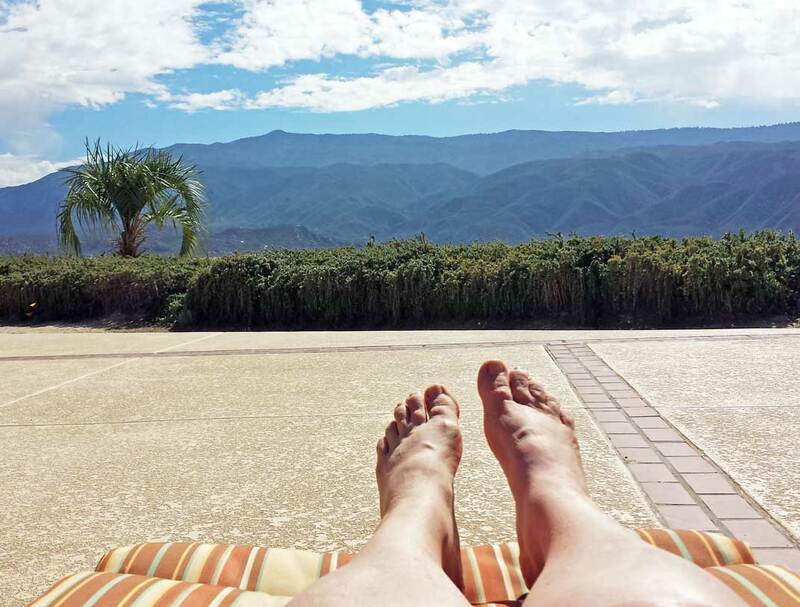 This entry was posted in 2014, California and tagged air gun, hot tub, Jojoba Hills Resort, quilt block, reading, rifle, swimming.